Imagine how much managers would LOVE this simple form! The problem is that an employee’s performance is much more than a simple thumbs-up or thumbs-down measurement. Although this is a simple solution, it does not meet any of the objectives of performance management such as providing actionable employee feedback, identifying top performers and underperformers, and supporting pay-for-performance. So what can you do to balance the opposing forces of simplicity and complexity? Fortunately, the struggle to achieve simplicity is not new. Whether you are implementing a technology or optimizing a process to deliver more value to the business, there is a clear path to balancing simplicity with the real-world issues of a complex business environment. When you find yourself in this situation, answer three following three simple questions before you begin. It can mean the difference between a high-impact result and a protracted headache. Do you know what you’re trying to achieve? This is probably the most basic planning question. If you are not intentional in designing or refining a process or an organization to achieve a set of specific goals, your redesign effort will be unlikely to create a solution that accidentally meets those goals. 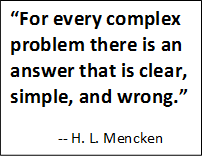 For example, trying to remove unnecessary complexity from your performance management process is an admirable goal; however, removing that complexity is only effective if your process still meets the goals of performance management. If a company doesn’t take the time to identify what the goals of performance management are (e.g. to give employees and managers an improved ability to track performance, identify and address weak areas, reward high performance, identify underperformers, and fuel a pay-for-performance philosophy), the simplification may result in the aforementioned inadequate thumbs-up / thumbs-down process. To be successful, you must be specific and intentional about your goals. Do you know that your plan will achieve your goals? This seems like an obvious question. If you have a plan, of course you believe it will achieve something. In fact, in many cases a troubled project will follow the idea that something, anything must be done. However, that something must be clearly aligned with the determined goals of the initiative to accomplish the desired outcome. If leadership has determined that you need to upgrade your HRIS system or re-vamp your internal promotion process and you develop a plan to do it, your job isn’t done. Not only do you have to sell your plan and gain buy-in, but you have to sell the connection between your course of action and the specific business outcomes your plan intends to achieve. Have you considered different perspectives? It’s tempting to move a strategy through with as little debate as possible. If you want to simplify something and you have the support from select people to do so, moving forward to execution will be the quickest route to accomplishment, right? Not exactly. One of the biggest causes of wasted time and resources is a lack of thorough consideration during the planning of a project or initiative. Even if the pressure is not there to do so, go out and invite input from as many stakeholders as possible. The object is not to complicate a project at the outset; rather, it is to avoid complications down the road. None of these ideas are new, but if you are having the conversation about simplifying any aspect of your talent operations, it pays to stop and consider these three questions. The results are well worth the time invested. 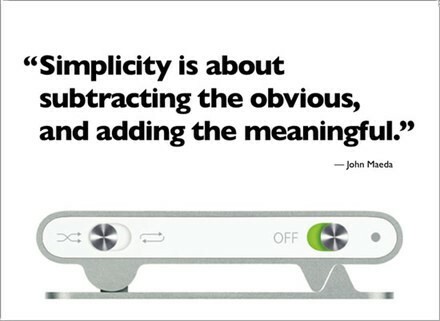 It’s ok to embrace simplicity — as long the simplicity still delivers value to the business. Andy has played an instrumental role in the success of his clients, working with Fortune 500 companies and other organizations on critical initiatives including integrated talent management strategy and planning, talent management transformation, change management, business process improvement, and technology selection and implementations.